In the Land of 10,000 Lakes, paddleboarding continues to grow in popularity. Whether you sit, kneel or stand, this water-based sport is a cross between surfing and canoeing. If you love paddleboarding, or are thinking of giving it a try, there are two new Small Group Training classes at the Y for you to try—WAVE Fit and WAVE Yoga. Although there’s no paddle used in these indoor, all-weather classes, both allow you to work out on an inflatable paddleboard that clips to pool lane lines for added stability and little drifting. This circuit-style class has you doing conditioning drills for your whole body. You’ll build endurance, strength and coordination as you do a variety of exercises on the paddleboard. The Y provides all the equipment you’ll need for WAVE Fit. Expect to use your bodyweight, plus resistance balls and tubing as you stay balanced above the water on a paddleboard. If you like land-based classes like R.I.P.P.E.D., Tabata or Boot Camp, or if you enjoy other water exercise classes—consider adding WAVE Fit into your workout plans for a fun, new challenge. Practice yoga sequences on the board to build stability, flexibility and strength. This class uses a pace slower than on land, since you’ll also be balancing on the paddleboard. Unlike land-based yoga classes, you won’t need a mat—it’s built into the Y-provided paddleboard. Sometimes, class might also use blocks and straps to help deepen poses. If you have wrist or shoulder issues, take extra care in this class. Previous yoga experience isn’t needed for this class, however, if you already do yoga, WAVE Yoga can help take your practice to the next level in an exciting way. Senior Director of Health and Wellbeing, Jennifer Menk suggests that you should wear what you’re comfortable in to these classes. “Some people wear swimsuits, others wear workout gear—the important thing is to avoid wearing cotton and choose fabrics that are water wicking,” she says. Like all other classes at the Y, WAVE Fit and WAVE Yoga include a warm up, workout and cool down. Instructors are prepared to offer modified exercises to help match your ability. You don’t need to be a proficient swimmer to enjoy these classes, but you will need to get into the water to get to your paddleboard for class. Pool depths vary by location, but because classes are held in swim lanes, at least some of the boards (if not all) will be suspended in shallow water. If you’re not a strong swimmer, Jennifer encourages you to get to class a little early to ensure you can choose a board in the shallow end. For WAVE classes, there is usually other activity happening in the pool, so be prepared for other people to be in the water. However, classes are held in dedicated swim lanes, so you won’t be right on top of anyone. Take a sneak peek into a WAVE class with this short video. 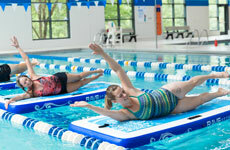 WAVE classes require registration—each class is $112 (members) or $154 (non-members) for a seven-week session. In the first session, there’s extra time to get acclimated to using the paddleboard. Ready to have a blast? Register for a WAVE class near you.